Cleaning agents for the woodworking trade. Release agents for the woodworking trade. Lubricants for the woodworking trade. Cleaning agents for the plastics trade. Dissolving agents for the tooling trade. If you have a cleaning problem such as; press platens, glue spreader rollers or edgebanders, or you wish to prevent glue contamination on machine parts then call us. Release agent in paste form for veneers, urea and melamine resin adhesives. Applied to platens to avoid adhesion of glue to platen surface. Silicon free and has good skin tolerability. Application: recommend using a wooden batten, say 100 x 50 mm fitted with felt on both sides. Apply the past to the felt and with two operators (one each side of the press) can quickly apply the past to the top and bottom surfaces of each platen in that daylight. Available in 180, 20, 5, and 12 x 1 kilogram containers. As above but in liquid form for spray application. As above but ideal for phenolic or similar resins (PVAc). Supplied in liquid form for spray application. Available in 180, 20, and 5 kilogram containers. Available in 170, 20, and 5 kilogram containers. Release agent in liquid form, used in processing decorative films and high pressure laminates. Spray on application. Available in 160, 20, and 5 kilogram containers. Release agent in liquid form, used in the manufacture of plywood. Release agent for spray booths. Supplied in paste form for brushing or spraying. Applied to all metal surfaces, no solvents and good adhesion (even to vertical surfaces). Lacquers and adhesives can be peeled off leaving the agent behind. Release agent for urea, melamine and PVAc adhesives as well as phenolic resins. Used in glue spreaders, RF presses, plywood and fibre board production and lacquer application machines. Dries to a hard surface and highly resistant to abrasion and elevated temperatures. Has good sliding action. Release agent for thermo plastic adhesives on edge banding machines and for phenolic or similar resins which are applied in liquid form without pre-drying. Good parting action and pressure rollers remain operative. Available in 170, 20, and 5 and 12 x 1 kilogram containers. Universal release agent in aerosol cans for nearly all glues and adhesives and especially on edge banding machines for those difficult to reach places. Available in carton of 12 x 400 ml cans. Release agent for short cycle presses. Ideal for preventing anti-static on conveyor belts, press transport belts and Mylar sheeting. Must be applied to both sides of the belt for effective results. 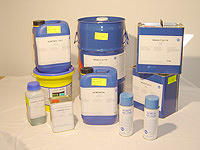 Release agent for thermoplastic adhesives on edge banding machines. Suitable for automatic feeding device on edge banders (RIEPE) or can be applies with brush or cloth. Applied to panel surfaces to prevent over spill of the adhesive. Available in 200, 20, and 5 and 12 x 1 kilogram containers. As above but suitable for PVAc adhesive. Available in 180, 20, and 5 and 12 x 1 kilogram containers. Release agent for resorcinol resin glues (i.e. Kauresin and PUR glues). 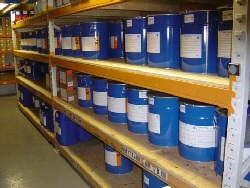 Supplied as a paste and can be applies with brush or cloth. Available in 150, 20, and 5 kilogram containers. Release agent for phenolic-resin coated surfaces or similar resins. Ideal for coating ply moulds for concrete moulding in the building industry. Available in 180 and 20 kilogram containers. Available in 180, 20 and 5 kilogram containers. Cleaning of plastic surfaces i.e. PVC windows and doors and pvc car interiors. Grease, dirt, pencil marks etc can be removed when applies with a viscose sponge. Available in 20, 5, and 12 x 1 kilogram containers. Used on glue spreading machines using urea and PVAc adhesives. Dilute one part cleaner to 10 / 15 parts water and rinse over rollers to break down the adhesive residues prior to final cleaning down procedure. Available in 20, and 5 kilogram containers. Facilitates the removal of hot melt adhesive residues from glue spreading machines, collecting tanks and stirring mechanisms. Applied onto the residue with hand spray gun, brush or cloth and remove with a spatula after a short exposure time. Can also be diluted with water to remove slight contamination from tooling and finished surfaces. Available in 20 and 5 kilogram containers. Similar to above but suitable for removing Cascamite residue. Used for removing deposits on press plates. Available in 850, 200, 20, and 5 kilogram containers. Resin solvent for woodworking tools. Dissolves resin residues and can be diluted with water. Not flammable. Sprayed or brushed on. Can be used in bathes for soaking. Will oxidise on non ferrous materials. As above but does not oxidise on non ferrous materials. Some examples of the wide range of ACMOS agents which we can supply ex-stock. We can get stocked items to you anywhere within the UK with a next-day delivery service. Lubricant for contact surfaces on woodworking machines, sliding rails, hinges, drawer, saw blades, milling and moulding cutters, veneer jointing machines. In liquid form for application with brush or cloth. Can be applied with small manual spray gun. Available in 200, 20, 5, and 12 x 1 kilogram containers. As above but supplied in paste form. Available in carton of 12 containers. Spindles and routers. Where wet, new or coarse wood slides over metal. Will not contaminate pumps, lines or nozzles. Corrosion protection. Application with automatic feeding device on the machine. Available in 180, 20 and 5kilogram containers. As above but in liquid form with petroleum as the carrier. Application with automatic feeding device on the machine or via small hand spray gun. Available in 150, 20, 5, and 12 x 1 kilogram containers. As above but with a mineral oil carrier. Transport friendly and flashpoint >60 degrees centigrade. Lubricant for plastic sliding surfaces. Ideal for plastic drawer slides. No biting or swelling of the plastic. Applied with brush or cloth.